I seem to have next to no time to update my races or my training anymore, so it looks like I will just update things when I am able. Since my last post, I spent much of the summer training for another JdF Epic tilt at the end of August. The training went reasonably well, but I certainly should have put more mileage in if I wanted to be serious. On the day, a couple elites took part (like Sean Chester) so that aspect of it was exciting for sure. For me, I did the first 22k in 3 hours, a pace that was certainly too fast (relative to my training) and like all long distance events, starting too fast will put you in your place awfully quickly. The second half was miserable, but I hung on to finish the 47k trek in 6:45 this year. It was a shame, as I likely had a sub 6h time in me if the pacing was better. I am confident that one day, I'll achieve this feat, but may take a few more tries to get the pacing correct. The day was awesome though, and the conditions were ideal for a PB. I likely will tackle this again in late August of 2013. After the summer, I settled into a training program of 3 days/week with my long runs being somewhere between 12-20k - a very minimalist program, but one that really had the primary goal of just keeping my in shape. I did ramp things up a little as I headed into Race 1 of 3 of the Fall XC Series. On Nov. 11th, I raced in the 20k Thetis Lake Relay. I was stunned to see Simon Whitfield in the race, and I ran very well to come 4th in my division (1:13:33). I was very satisfied with steady pacing, and I made this a priority so that I could perform to my potential. A couple weeks later, I was in the 10k Gunner Shaw race. This race is notorious for water and mud, and with the crazy wet conditions in October and November, the conditions were as nasty as they have ever been. Once again, I started too fast and found myself in ~10th place after about 3k into the race. When we hit heartbreak hill, my heartrate was much too high heading into the hill and I red-lined pretty fast and was forced to power hike up the top of it. I also spent much of the next 2k in recovery mode, and several runners went by me like it was my first 10k race ever. However, I did find my legs again about 5k in and I tucked in behind running club-member (and top female) Claire Morgan and we flew along the 2nd half of the course. When we hit the "Gunner" hill series towards the end, I charged up some adrenaline and passed Claire and hammered into the finish. While it was not a well-paced race, I did finish with a decent result and was proud of the 2nd half effort. 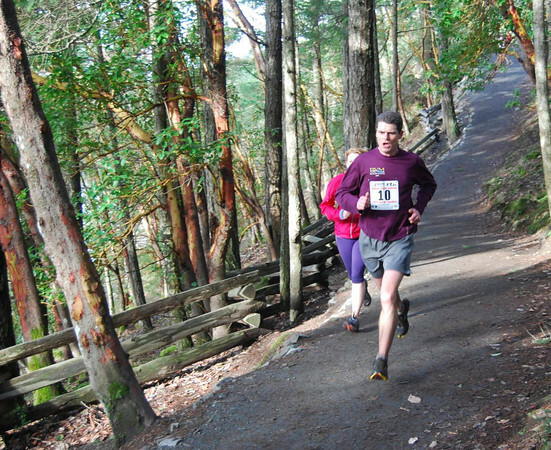 The final race of the Series was the 16k Stewart Mountain Race - my favourite :). I enjoy the distance and the hills, and much of the Gunner mud and water was still around. I started the race intentionally slow, wanting to be patient. In the early going, I was behind a couple of runners that I would like to beat, but stayed the course and stuck to my guns. By the time 5k rolled around, I was feeling quite good and made a pass up a slow hill, leaving 3 runners behind me. Another pass at the water station took me to the bottom of the mountain, where I power hiked the majority of it, wanting to conserve my energy for the 2nd half of the race. The plan worked, and by the top of Stewart Mountain I had not been passed by anyone, and I had passed another 2 people just power hiking. The downhill section came, and I was ready for it. I flew along this portion, gobbling up some valuable distance. Nobody seemed to be in front of me now, and I felt like I was opening a good gap behind me. A small little leg cramp at 14k reminded me to stop for water, but it luckily went away fairly quickly. The end portion of the race continued to be good, and I finished having a superb race. Overall, I finished in 17th place. My time was nearly identical to the time I ran 2 years ago in this race, but the event that year was on a shorter (and slightly easier) course. So the year was a bit mixed. I rarely seemed to get in the training that I wanted to, but made the best of the situation. I did manage to stay relatively uninjured this year, and that is always the primary goal. The end of the year ended very well with 3 solid races under my belt. Looking ahead to 2013, I am signed up for the Island Series, and will definitely take in 6 or more of those races. I do not know beyond that, and it will likely depend on where I can fit extra training sessions into my daily weekday schedule.